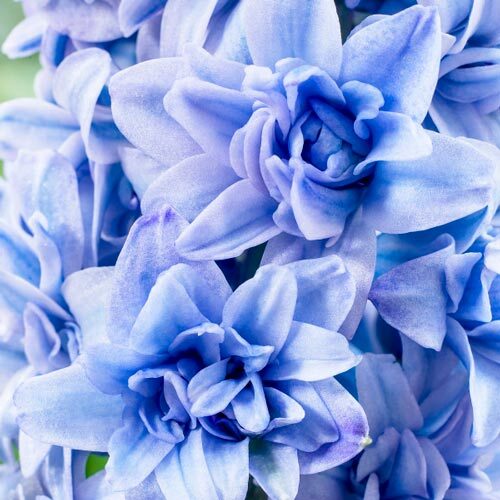 Beautiful, double-flowered variety has two-toned flowers in soft blue hues. Double-flowered hyacinths have limited availability because they're more difficult to propagate than single-flowered varieties. In the 1800's, the double-flowered varieties were quite popular and many were grown, but as fashions changed, they fell out of favor and many doubles were lost. The double varieties are now experiencing a resurgence. Growing 8-10" tall, Blue Tango is very fragrant and resists deer. It grows well in a sunny to partially shaded area in the garden or containers. Blooms in early to mid spring. Bulb size: 16-17 cm. Medium green, linear with curved edges.